Sligo is one of my favorite counties in Ireland and is one of the best places in Ireland to visit by train. 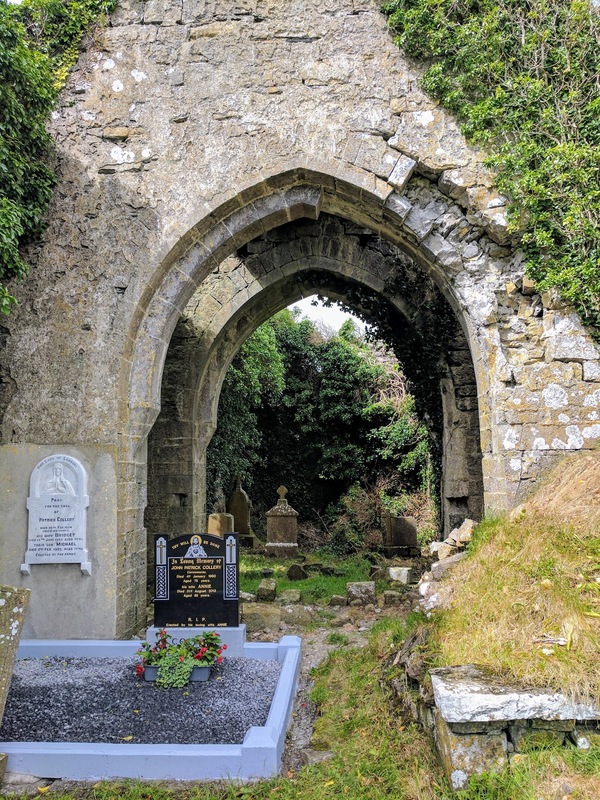 Situated it the northwest of the Emerald Isle, County Sligo has a great mix of warm and friendly people, amazing food, and stunning scenery. 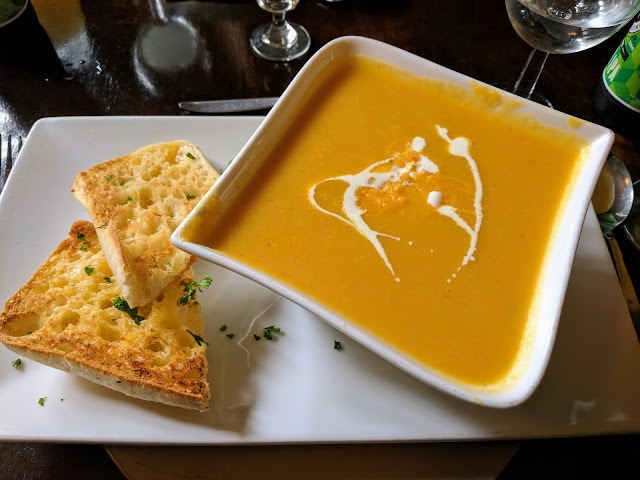 We returned to Sligo in August 2017 to try one of the new food/adventure pairings from the Sligo Food Trail. 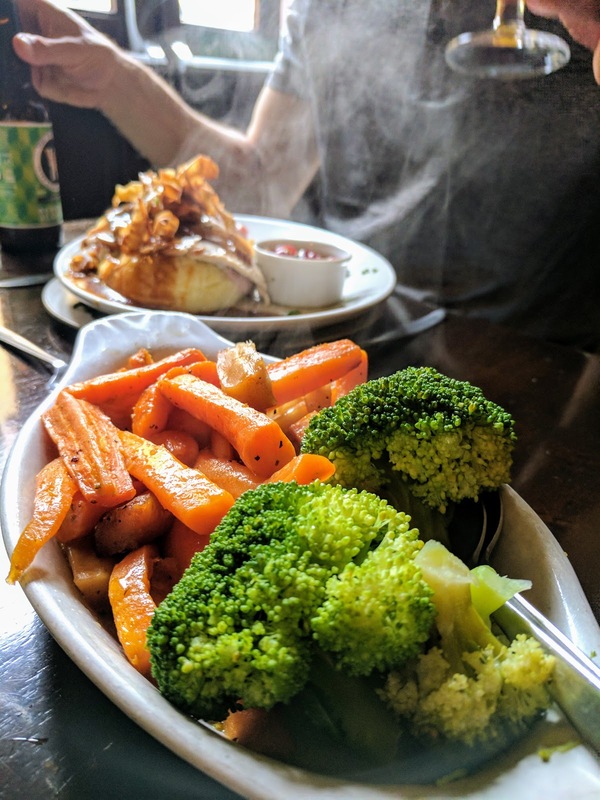 Hiking and outdoor adventure travels definitely build up an appetite and Sligo Food Trail has both sides covered. 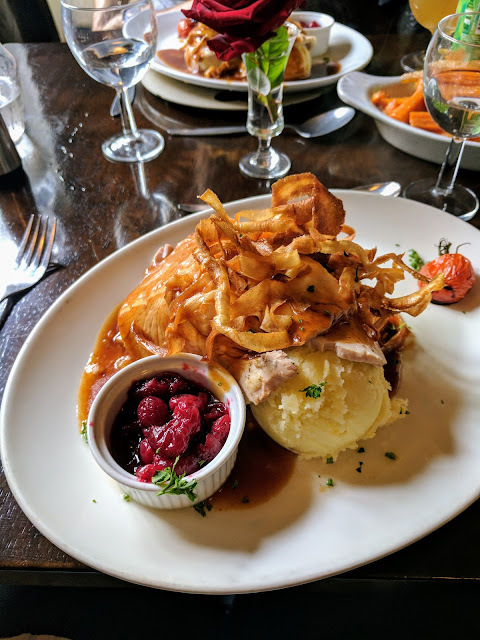 We signed up for a morning of hillwalking in the Ox Mountains with John from Wild Wet Adventures followed by a leisurely Sunday lunch with Teresa of Cawley's Guesthouse in Tubbercurry. It seemed like the perfect combination of exercise and comfort. We rendezvoused with John at Lavagh Friary (aka Court Abbey) at around 10:30 am. 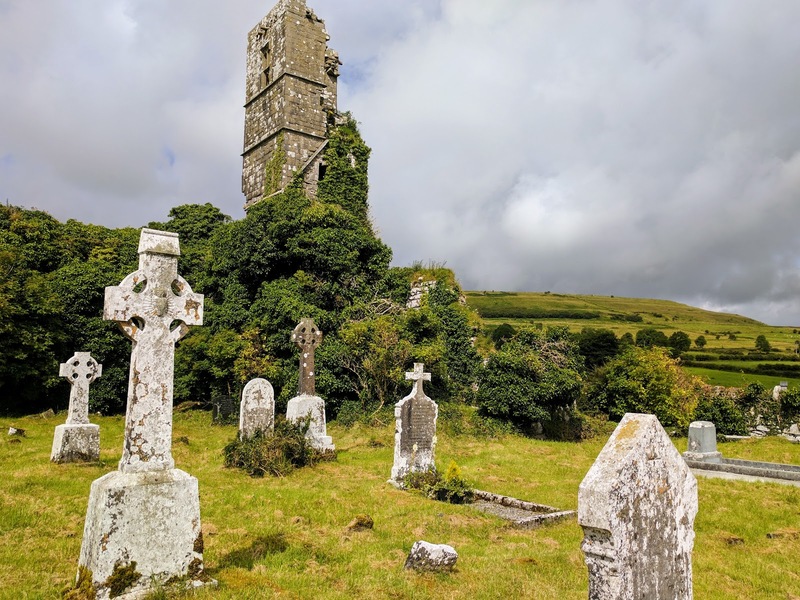 Dating back to the 15th century, all that remains of Court Abbey today is a crumbling church tower partially reclaimed by surrounding greenery and a cemetery featuring Celtic crosses bleached by the weather over the years. We carefully picked our way through the ruins as John told us a bit of the history of the place and about the walk up Knocknashee ahead of us. We returned to John's van. He took a look at the shoes that I was wearing (regular sneakers/trainers without a ton of ankle support). 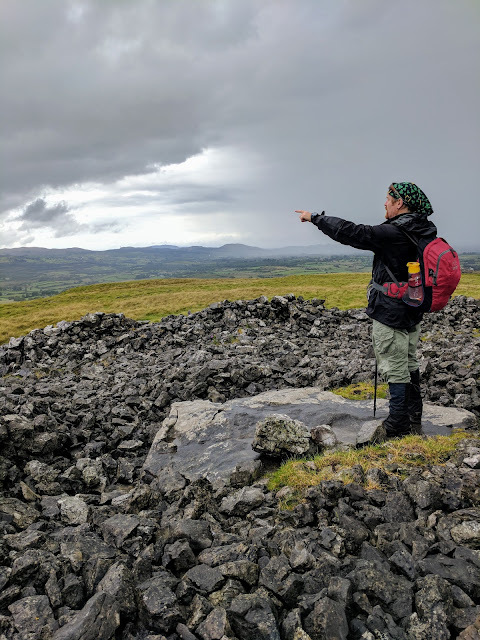 We were in Sligo for the Hagstravaganza beer tasting event the previous day at White Hag Brewery and I had opted to wear my city shoes thinking they would be 'good enough' for the hike up Knocknashee. John hopped into the back of his truck and popped out with a new pair of hiking boots that happened to be a reasonable fit. I was super-impressed and appreciative. On a nice weather day, my trainers probably would have been fine but given that it had been raining a lot at the time, my feet would have been wet and muddy without this emergency shoe loan. I really appreciated that John was prepared and looking out for the comfort and safety of the folks he's taking on tour. 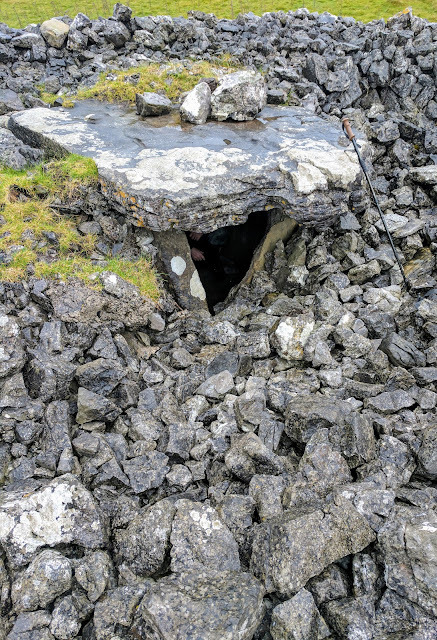 We never would have found the entrance to the trail to Knocknashee without John. We drove and parked in front of a small farmhouse. John unlatched the gate to the field and carefully closed and latched it again behind us. Knocknashee is surrounded by private property but as long as people know where to go and are respectful of the farm's property, you can pass through. We broke into a steady climb through tall grass. Soon we were looking back behind us at sweeping views of Court Abbey and the surrounding valley below. We could see the various farm plots in the region edged with trees and bushes. We definitely met more than a few curious sheep on our hike up Knocknashee. One flock flat out stopped to stare at us. We also met a few lone sheep scratching their backs among the tall weeds. As we huffed and puffed our way uphill, we noticed thick ominous clouds rolling in. Fortunately for us, John was prepared for anything. When the rain started bucketing down, he whipped out a 4-person emergency shelter. We crouched under the bright orange tent with the rain falling all around us. After about 10 minutes, the storm passed. We peeked outside and when we realized the coast was clear, John shook out the tent, folded it up and put it back in his pack. After about 30 minutes of climbing, we arrived at the top of Knocknashee. A hill fort was discovered here in the late 1980s. A hill fort is a raised area used as a fortified settlement. Hill forts were typical during the Bronze and Iron Ages. With these historical bounds in mind, Knocknashee could be between 3-5 thousand years old! There was even a small intact shelter at the top of Knocknashee. It was a tight fit but we managed to squeeze two of us inside to take a look around. After our hike in the Ox Mountains, we piled into John's van and set a course for Tubbercurry and Cawley's Guesthouse. 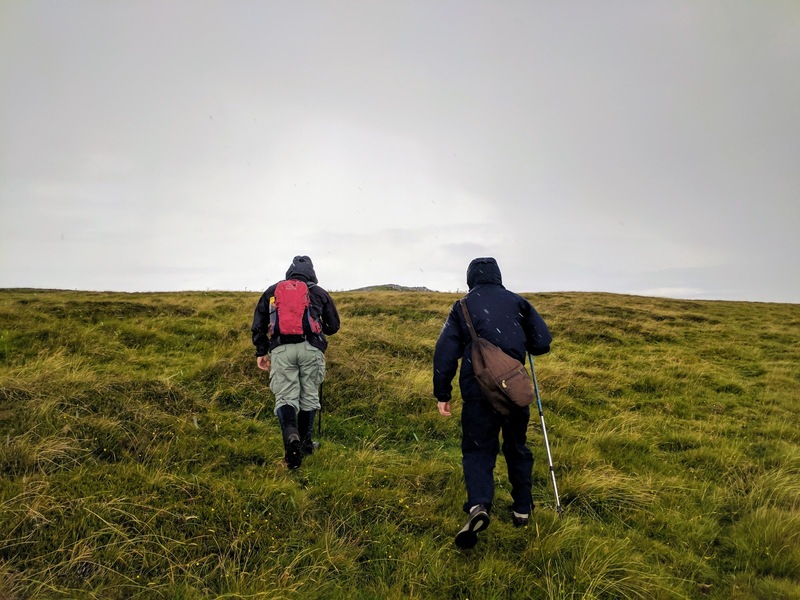 We must have looked quite the sight: windblown and wet from our Wild Wet Adventure hiking Knocknashee. We took a moment to clean up (and to return John's hiking boots!). Fortunately, we were returning to Dublin that day and had our bags with us and a dry change of clothes. Teresa ushered us to a cozy table at the back of the hotel bar. We were famished and really looking forward to a hearty lunch. We started with beer and cheese soup made with local White Hag brew. 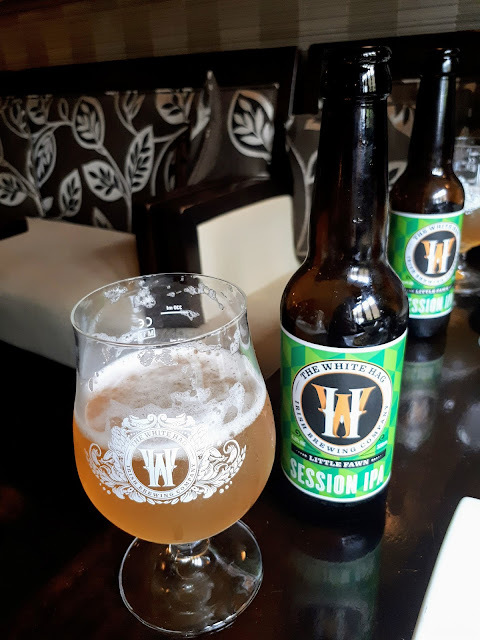 A bottle of Sligo's White Hag Session Ale paired well with our starter. A huge plate of turkey and ham followed with a side of steaming vegetables. The food was deliciously prepared and super-filling. I cleaned my plate but was ready for a nap by the time we finished. Teresa offered us dessert but there was no way I could squeeze in an ounce more of food into my stomach! Teresa insisted on sending us home with a jar of her famous rum balls and homemade brown bread in case we got hungry on the train back to Dublin. After lunch, we hung around at Cawley's to listen to an Irish Trad music session accompanied by a pint of Guinness before catching the train from Ballymote back to Dublin. 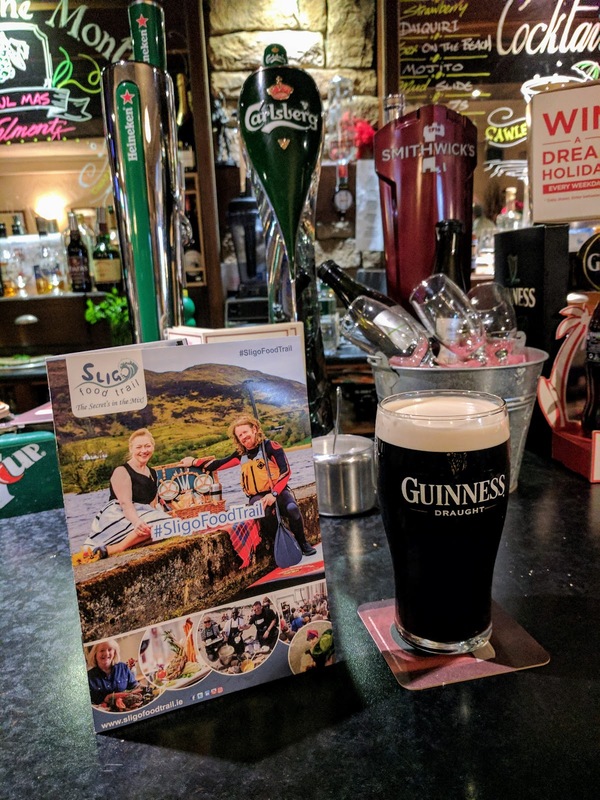 Every time I visit, I really appreciate the atmosphere in Sligo and the friendly locals banding together to show off their corner of Ireland to the world. 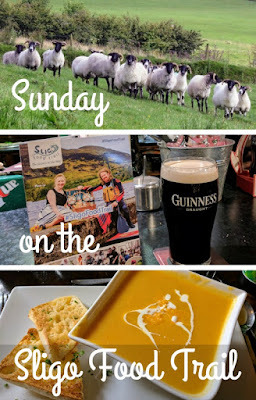 I recommend checking out the Sligo Food Trail brochure and signing up for a foodie adventure. Disclaimer: My husband and I were guests of the Sligo Food Trail on this trip. Our taxi transportation from Sligo Town to Court Abbey and from Tubbercurry to Ballymote was complimentary as was the hike and lunch. We paid our own way from Dublin to Sligo and back again. The opinions expressed in this post are my own. Come along on a hiking and foodie adventure on the Sligo Food Trail spending Sunday climbing Ireland's Knocknashee and eating at Cawley's Hotel in Tubbercurry. A photo rich post by travel blogger, Jennifer, aka Dr. J, from Sidewalk Safari.